I found in a german forum, some users have Enterprise without the cartridge module, and want informations how to build cartridge? I invited this users to our forum, now the first is registered here. Welcome Weltverbesserer! You are the 50th user here! The EP64 originaly have 2x8K socket in the cartridge. On this PCB, you can found a "jumper" (LK1) with this, you can switch to 2x16K mode. The EP128 come with this 2x16K type cartridge, or 1x32K. The english machines have only one 16K ROM wirh the IS-BASIC, and the german machines have additional 16K EPROM with the German extension (called as BRD, this contains German keyboard handler and messages, and VLOAD,VSAVE,VDUMP utilites for loading,saving,printing video pages). But the cartridge socket on the machine have total 64K address space. In Hungary many useres modified their cartridges up 64K (2x32K or 1x64K). I think at today build new cartridge, the 1x64K type is the best choice. For this, is only one component needed: 1 pcs. 27C512 EPROM. 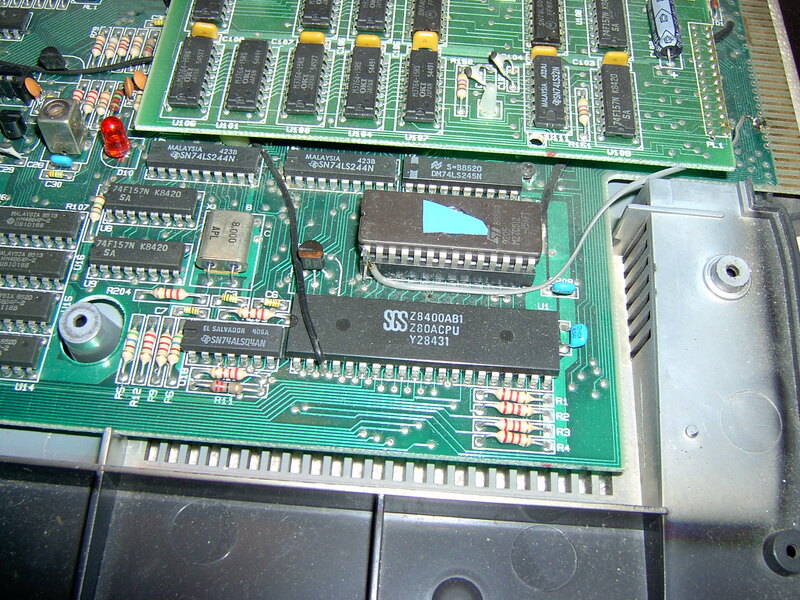 The wiring: EPROM A0-A15 to the cartridge socket A0-A15, D0-D7 to D0-D7, OE to RD, CS to CART. 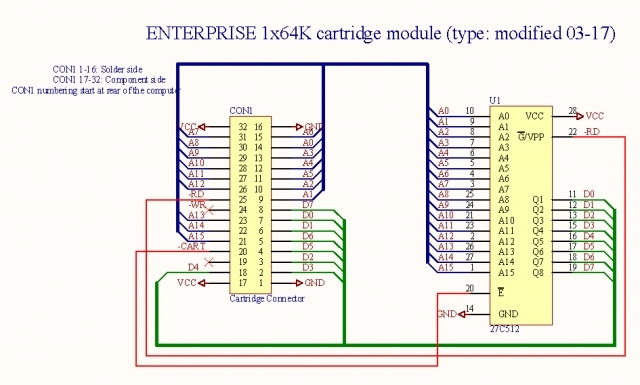 You can found here the schematics of the Enterprise (an many extensions). The cartridge socket pinout at the page 64/2. Upgrade the internal ROM to EXOS 2.3 (developed by me ), this version contains the IS-BASIC 2.1, and the WP 2.6, and many extra features. With this way, not needed to build cartridge PCB, but needed to dismantle the machine. The internal ROM socket only for 32K EPROM, but the address is decoded to 64K. For installing 64K EPROM (the EXOS 2.3 is a 64K), needed solder one wire betwen the EPROM pin 1 and the pin 9 of expansion port, this is the A15 address line. Thank you for your welcome. I am proud to be the 50th user. Thank you for the hints and drawings. I will try to do my best and post the result soon. 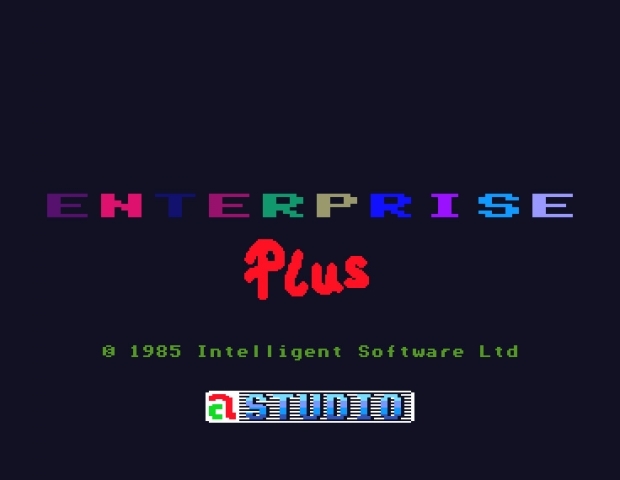 The 'a' STUDIO (hungarian software developers) developed a EXOS and IS-BASIC extension program, called as EP-PLUS. When you buy this program, you get a 16K EPROM with the program, and special 3 socket EP-PLUS cartridge. 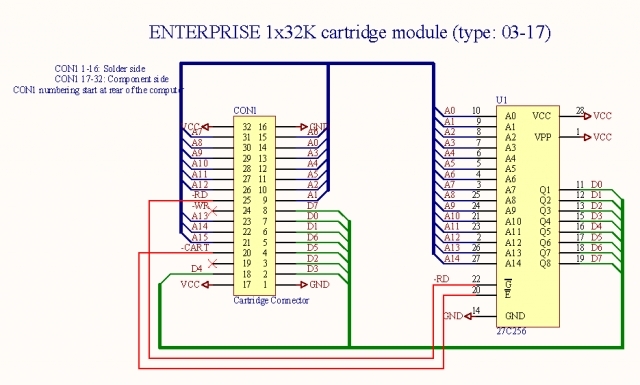 With this cartridge you can use 2x16K plus 1x32K EPROMs. The one 16K for EP-PLUS, and second 16K for the original IS-BASIC ROM, needed to transfered from the original cartridge. The 32K socket free for additional extensions.